Written by the P31 team whose daily devotion reaches over 1 million women every day, this book will help a woman know she is not alone in her every day struggles. For twenty years the women at Proverbs 31 Ministries has equipped and encouraged nearly a million women to live in the power of God’s truths that apply to every step of life. 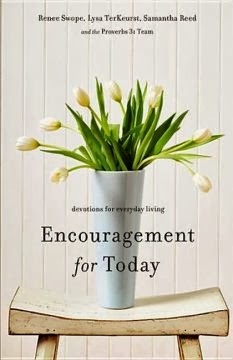 Here, the Proverbs 31 team offers 100 devotions of wit, wisdom, and encouragement to help women pull away from the things that pull them down and find lasting encouragement for today. Written by women from every walk of life, readers will find inspiration to live authentically and fully grounded in the Word of God. The P31 Team shares from the realities of everyday life including highs and lows, humorous stories, and tender moments as they draw readers toward the truths God offers. Hopeful. Down-to-earth. Relevant. Trustworthy. Each day includes Scripture, a devotion, a Reflect, Respond, and Remember, and a Power Verse. Ultimately, women will find comfort in the realization that they are not alone in their day-to-day doubts, disappointments, questions, fears, hopes, dreams, and struggles, and that they will be able to rise above and become all God created them to be. I was so so so excited to receive this devotional. I am a huge fan of the Proverbs 31 team and I just adore Lysa TerKeurst. I could not WAIT to dive into this devotional the day I received it. Isn't it so exciting y'all when you're so excited and the book doesn't disappoint you? Each days devotional includes a quick and easy read each day, with a few verses to meditate on, a brief commentary from the author, a reflection question or two, and a call to respond in some way. The devotions were short enough that even the busiest of mamas could fit it into her schedule. It is written in such a way that you can relate to every single devotional. There is a nugget that you can take away from each one and that is powerful. This would make for a great gift for a friend or a sweet treat for yourself. I think this is one your going to love!